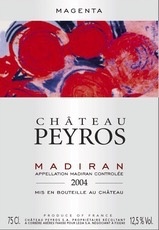 Wine Chateau Peyros Madiran Magenta 2011 - Royal Wine Merchants - Happy to Offer! Amazing run for your money! This estate dates back to the 17th century. It was acquired by the Lesgourgues family in 1999. With the help of Emile Penaud, Château Peyros was provided with a stainless steel tank. Also, a micro‐oxygenation system was setup in order to soften the wines made from Tannat. “Peyros” in Gascony language means a stony place, a strong characteristic of the terroir. Château Peyros is located in the most southern part of the Appellation, on an exceptional terroir. Two main types of soil: Very dense clay and limestone soil with rolled pebbles.